On 13 March 2017, Bob Campbell MW spent the afternoon in Hawke’s Bay, blind tasting his way through a sea of 2014 vintage Hawke’s Bay Chardonnay, Syrah and Merlot Cabernet blends concealed in brown paper bags. Mr Campbell then selected the top 12 2014 vintage wines to represent Hawke’s Bay, only finding out himself on Wednesday which wines he had selected. Bob Campbell was the second New Zealander, and is one of just over 300 people in the world to hold the Master of Wine qualification. Mr Campbell is an internationally acclaimed wine judge and is widely regarded as the New Zealand’s foremost wine educator. 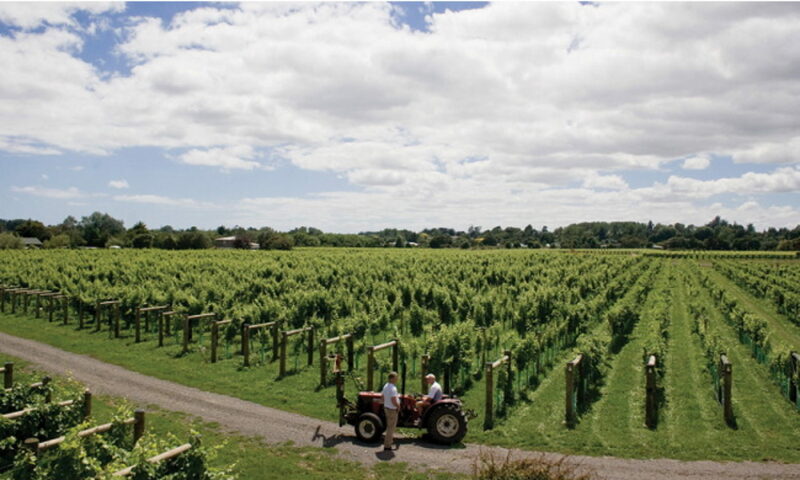 Founded in 2006, Hawke’s Bay Winegrowers Association Inc. represents all wineries and growers in the region and its mission is to achieve international recognition as one of the great wine regions of the world. Usually, I find this a time to reflect on what the year has offered. Following on from the regular BBQ in January we started off with a few hiccups in our arrangements. Nevertheless, tastings began on a high note in February with Ash Ridge from Hawkes Bay. March saw another late change, but an enjoyable evening was possible with club members presenting wines from our cellar. April allowed Ohau Wines to introduce us to some interesting local wines while May was, of course, our AGM. Things really got rolling in June with Taylor Brown, who are the NZ agents for Brown Bros and Taylors from Australia. They presented mainly Taylors as we had quite recently shared an evening with Brown Bros. July took us to Bistro 52, WelTec’s training restaurant for our mid-year dinner while August showed the enjoyable wines of the well-established Wairarapa winery, Gladstone. September was a highlight with the iconic Hawkes Bay producer Craggy Range, followed in October with Man O’ War from Waiheke Island. 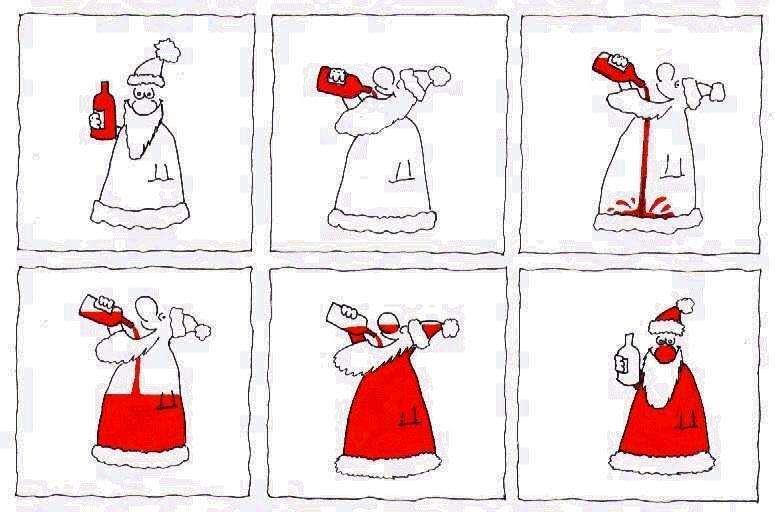 The tasting year finished with festive wines presented by Macvine International. Only the dinner to go to complete a very successful year. We have had some great tastings in enjoyable company. Unlike Susan Devoy, I am happy to offer my best wishes for the Christmas season. A great evening with a good range of wines which was evidenced by a very good level of orders from the winery. Some of the wines were very expensive, I am sure members are keeping them for a special occasion. Just to recap, the selection included the Gimblett Gravels Rose 2015, followed by the Te Muna Riesling 2014, the Te Muna Sauvignon Blanc 2014, and the Kidnappers Vineyard Chardonnay 2013. The reds included the high range Aroha (Pinot Noir) 2013, the Le Sol (Syrah) 2013 and the Sophia (Merlot) 2013. Altogether an excellent tasting, thoroughly enjoyed by those who attended. What a great tasting on offer. Miss it at your peril. You will note that the door cost is a little higher than usual. This is to ensure that members have the opportunity to taste great wines from a top producer. Enjoy. At the Gladstone tasting last month the winery set up a draw for any members purchasing case lots. On offer was a magnum of their 2009 Reserve Pinot Noir. This draw was won by Derek Thompson. Congratulations Derek. One of the country’s most experienced Sommeliers has been appointed Customer Experience Manager at Craggy Range Winery in Hawke’s Bay. Advanced sommelier Michael Bancks is working towards becoming New Zealand’s second only Master Sommelier and returns to Craggy Range after three years in France. Formerly Manager of Craggy Range’s Terrôir Restaurant for six years from 2004, Bancks was awarded the title of Sommelier of the Year at the Culinary Fair in 2008 while in that role. During his time in France, Bancks developed his fine wine and hospitality skills as Maître d’ at the Michelin Star restaurant of famed chef Michel Guerard at Les Prés d’Eugénie. Les Prés d’Eugénie served as the inspiration for Terrôir Restaurant after Terry and Mary Peabody shared a memorable meal at the estate. 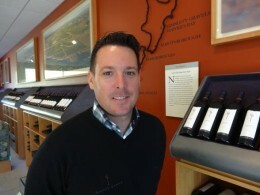 At Craggy Range, he is responsible for the Visitor Hosting Programme showcasing the winery’s unique experience to visitors and key influencers from around the world. He is also responsible for managing the Cellar Door. 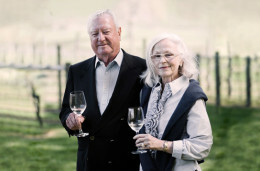 Bancks says he is delighted to be coming home to Hawke’s Bay, one of New Zealand’s most popular food and wine regions. “I am really enjoying being home in the Bay and very much looking forward to working with the Craggy Range team again. It was a tremendous three years in France where I was fortunate to be under the patronage of such a brilliant restaurateur as Michel Guerard. Craggy Range Chief Executive Officer Michael Wilding says everyone is delighted to welcome Michael back to the Craggy Range team. “Michael’s passion and experience as both a sommelier and Maître d’ brings enormous credibility to the role. The Visitor Hosting Programme is an integral component of growing our brand globally and we look forward to extending our hosting programme, creating and launching more layers to our Craggy Range experience over the coming months. “Michael always has been a phenomenal Craggy Range ambassador and truly understands and shares the Craggy Range philosophy, so we are very fortunate to have him leading our visitor hosting programme and the cellar door.” Michael took up his role at Craggy Range in May. Michael will be at the Cellar Club in September. Check events for details. 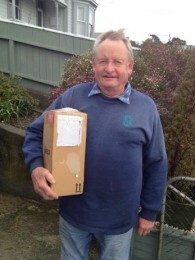 When Australian businessman Terry Peabody visited New Zealand in 1997, he immediately recognised his odyssey had reached its destination. He realised very quickly that the promise he’d made to his wife and daughter – to create an enduring family wine legacy – had come to fruition. They may have expected Old World France. What they got was something altogether more interesting. Terry sensed a new and exciting possibility in New Zealand, a potential he hadn’t seen elsewhere despite an extensive search of the world’s well-known wine regions. The exceptional climate and the spirit of the people aligned with his own philosophy and desire to cut a new path. His ambition was not merely to emulate the greatest examples of wine styles in the world – it was bolder. He wanted to create new benchmarks with wines that would become internationally regarded as World classics – wines that would be listed in the world’s greatest restaurants and sold by fine wine merchants. This is the philosophy behind our presenters for September, continuing with the fine list of Hawkes Bay wineries who have presented at our club. More detail next newsletter, but clearly an evening to look forward to. Emirates has unveiled details of its more than half a billion dollar “liquor investment” programme. The airline says that on any given day, more than 60 different wines, champagnes and ports, sourced from vineyards in 11 countries, including New Zealand, are served onboard Emirates to passengers throughout their planes. It has more than 1.2 million bottles aging in its own cellar in Burgundy, France, some only ready for drinking in a decade or more. Champagne is the most popular drink in first and business class and by volume 51.5 per cent of Champagne aboard is drunk in the economy section. New Zealand wines served inflight with Emirates over the past two years include; Cloudy Bay sauvignon blanc, Yacht Club sauvignon blanc, Metis sauvignon blanc, Amisfield sauvignon blanc, Spy Valley sauvignon blanc, Isabel Estate sauvignon blanc, Felton Road pinot noir, Rippon pinot noir, Craggy Range pinot noir, Peregrine pinot gris, Mills Reef Gimblett Gravels Reserve syrah. 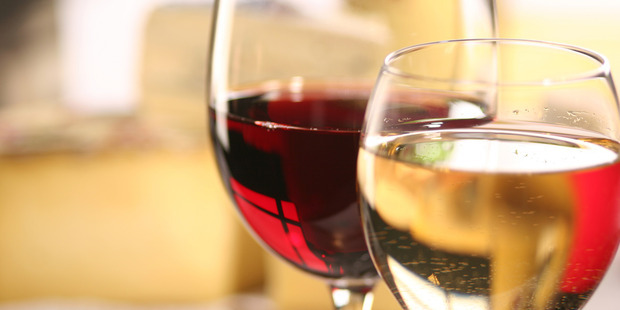 New Zealand wines have featured in first, business and economy class on Emirates flights. Emirates, which flies four times daily from New Zealand to Dubai and beyond via Australia, has a dynamic strategy of buying wines, and an intensive programme to secure the best vintages for future consumption by buying “en primeur” often before the wines are bottled and released to the market. The airline’s experts hand pick and secure the wines served onboard. President Emirates Airline Sir Tim Clark said that over a decade ago the airline moved away from the usual corporate procurement process and decided to take control of its own destiny. The airline has spent more than US$500 million on wine and spirits to date. 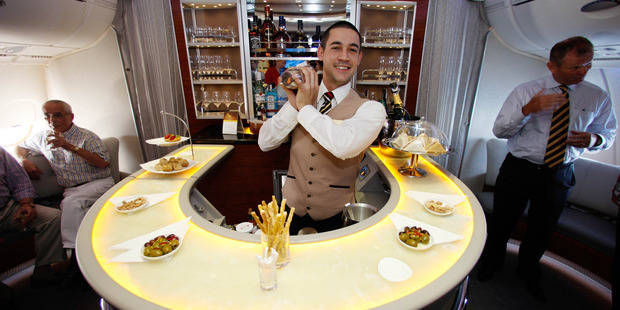 Besides wines, the airline serves 43 different spirits and 12 different cocktails. The 30-year-old airline is one of the biggest in the world and has the largest fleet of Airbus A380 aircraft. NZ Herald, Thursday Dec 4, 2014 – Grant Bradley – Aviation, tourism and energy writer for the Business Herald. Craggy Range has been named New World Winery of the Year in the Wine Enthusiast’s 2014 Wine Star Awards. Congratulations. Craggy Range Winery has been awarded one of the globe’s most prestigious wine awards, taking out the New World Winery category in the highly-regarded Wine Enthusiast Magazine’s Wine Star Awards, a remarkable accolade so early in the wine producer’s odyssey. 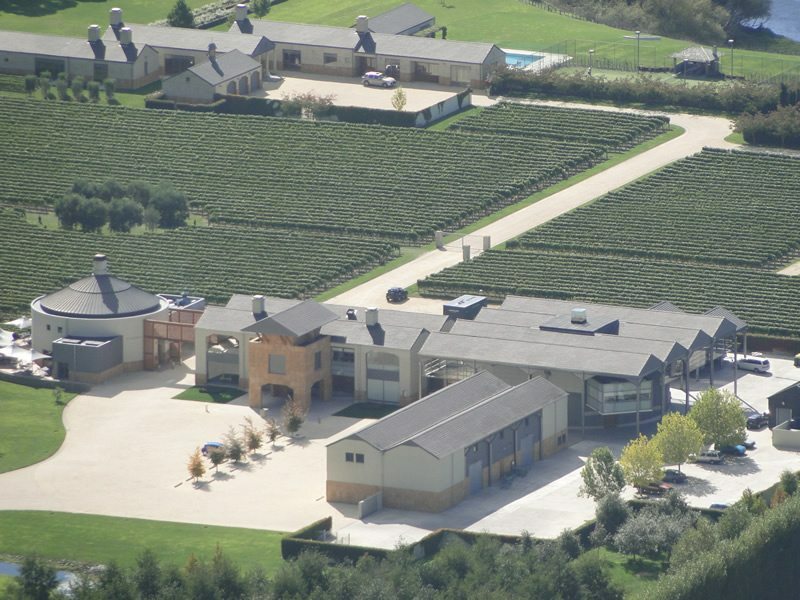 Craggy Range, founded on the premise of creating a 1,000 year family dynasty, was a finalist in the same category in 2013 which was taken out by Australian Winery, Penfolds. This year Craggy Range was up against producers from Brazil, Canada, South Africa and Chile. Owner Terry Peabody says the Craggy Range team is thrilled by the award. From its founding days, Craggy Range has taken a single vineyard approach to create wines that reflect the terroir of the land producing wine that is unique to the vineyard in which it is grown. Terry Peabody says 2013 was a particularly special vintage for Craggy Range. Wine Enthusiast Magazine was founded in 1988 and with 800,000 readers is regarded as the world’s largest periodical devoted exclusively to wine and spirits. Each year the editors of the magazine honour the individuals and companies that have made outstanding achievements in the wine and beverage world. 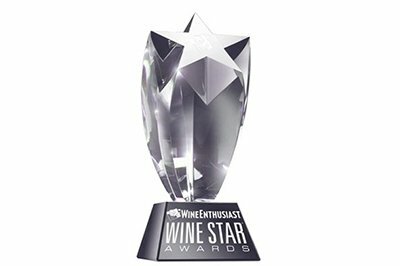 The winners are announced in the special December 31 Wine Star Awards issue (out December 1), and the honorees are presented their trophies at a gala black tie dinner in New York City on January 26, 2015. Read more about the Wine Enthusiast’s 2014 Wine Star Award Winner. Note: The Cellar Club committee has arranged for Craggy Range to present to the club in September 2015. Some internal Club “News” this month. Our President and Secretary, (with a nominated driver, ie Mr Secretary) embarked on a journey fraught with danger over the recent holiday weekend. The following is Anne’s account of the trip. I don’t know how they coped. To experience as many wineries (and other delights), in the Hawke’s Bay area as possible in 4 ½ days over the Easter period. The trio set out from Grenada Village in the morning, following State highway 1 over the Rimutaka Hill. A slight detour to Parkvale mushrooms and then the first stop – Gladstone, where a sticky was purchased to be consumed with Hot cross buns. Arrived safely in Napier, found the information center, supermarket and accommodation and settled in; had a lovely meal at an Italian restaurant, and an early night. Good Friday – Slight hitch – most of the Christian world was shut for today. We have a good cooked breakfast, just in case we can’t find anywhere open, and go for a drive anyway, to find Unison Winery open for lunch but not tastings. Discovered they have a very nice sparkling rose, and a most substantial platter. Drove to the top of Te Mata Peak, saw from there that Craggy Range was open so dropped in. Slight deviation from wine-ing to visit a Book Fair, as Richard has managed to leave all his reading material at home and has already finished one of Anne’s chick lit books. Went to Crab Farm, Esk Valley, Eskdale, had tastings and a lovely lunch at Linden Estate, Visited Mission Estate for a look around, Church Road. Wonderful dinner at Mission Estate. Easter Day – Hastings Farmers Market, fruit, olive oil, sausages, all very good; Vidals, The Beach House, tiny place, very rustic, very nice riesling, and late harvest riesling, Te Awanga, Elephant Hill, lovely statue, restaurant very up market, but not much appealed in the wine department . Lunch at Clearview table in the vineyard, exceptional afternoon, good, good food, good wine, a perfect lazy Sunday afternoon among the vines. Up bright and early (ok it was about 8.30am), and engaged in a combined house cleaning and car packing exercise; then off to Havelock North. Called into Advintage and said hello to ‘Mac’ and then went Te Mata and Black Barn and then headed home.